SCC Club was approved as a chartered club by the Sun City Community Association in June 2018. We are drafting policy and have bylaws to govern operations. We have already requested rooms for use in 2019 - free now to the Club! How many Sun City residents have asked you what they can do with their bikes that they no longer ride? Our Cycling Club plans to return bikes to the streets of Central Texas. From November 8-12th, Sun City Cyclists is going to harvest bikes from Sun City residents and donate their ‘loved, but no longer used bikes’ to the Austin Yellow Bike Project (AYBP). AYBP is a [501c(3)] educational program that guides folks in how to repair and maintain bikes. They are a volunteer-based non-profit that has operated for 21 years. AYBP started up by reusing 26 bikes destined for the dump. They repaired and painted the bikes yellow and put them on the streets of Austin for anyone to use - but not keep. The City of Austin liked the idea and launched a City-wide bike share program. AYBP turned to running a community bike shop that educates and trains through their extensive shop resources. Through bike donations, donated labor, and the sale of bikes, AYBP now has 5 paid mechanics and in 2017, hosted 15,700 users and donated 628 bikes! Cycle members involved are Mark Geppert, Bill McMillan and Leanne Smith. Brad Sorensen has offered his garage as temporary storage for the bikes until AYBP picks them up. We have several other members who have offered to help Bill harvest bikes. Let your neighbors know - they can schedule their bike and bike accessories for pickup on Thursday-Monday, November 8-12, by emailing Bill at billmcm1965@gmail.com or for more info, call Leanne at 541-977-8285. AYBP will refurbish these bikes and make them available in time for the holidays. You can feed in your monthly mileage ﻿here﻿, or through an email to Mark Truesdell via truesdell mark51 @ gmail.com. The Sheriff's department suggests that if you have had an encounter with any dog in the county, contact Animal Control at 512-864-8282 EXT 11. They need a description of the dog and exact location of the incident. While there are no leash laws in the county, problem dogs can be addressed. 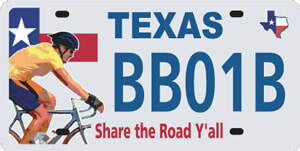 The Texas Bicycle Coalition is proud to announce that our Share the Road license plates are now available for purchase! A portion of funds go directly to bike safety education programs.